Fruit reductions can be used as sauces for anything from dessert to pork loin. A fruit reduction is a simple way to bring out the flavor of fresh fruits. Making a reduction involves boiling away the water in the fruit so that the flavor intensifies. Any fruit and fruit juice combination may be used to create a reduction, so it’s easy to customize. For the greatest ease, you don’t even have to use fruit -- reductions can be made with just juice. Either way, the thick concentrate is tasty as a sauce for everything from steamed asparagus to vanilla ice cream. It also pairs well with meats such as chicken and pork loin. 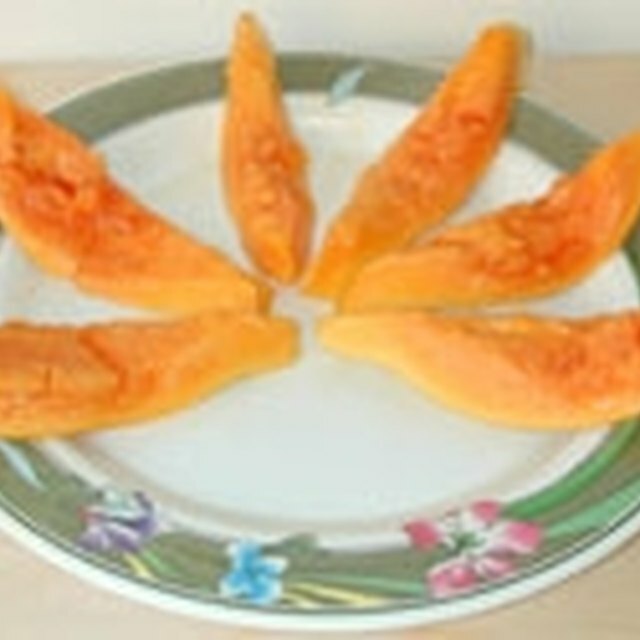 Wash, peel, deseed and remove the stem from the fruit as needed. Cut the fruit into small pieces. Place the fruit in a small saucepan and mash into a chunky pulp with a fork. Place the saucepan over medium-low heat. Stir the juice into the saucepan. Bring the mixture to a high simmer, stirring frequently. Reduce the heat to low. Simmer the fruit mixture until the sauce has reduced by at least half, stirring frequently. Continue to simmer, stirring frequently, until the desired consistency is reached. Remove the sauce from the heat and let cool for a few minutes before serving. There are many different fruits and juices you can combine to create an assortment of tasty reductions. Mix strawberries with pomegranate juice to create a sweet and tangy sauce for cake. Combine raspberries and raspberry juice to create a rich topping for ice cream. Blend mango and pineapple juice to create a sweet topping for chicken or pork. There are many ways to make the flavor of a reduction more complex. Common additions include sugar or honey for extra-sweetness and vinegar or lemon juice for a tangy twist. Don’t forget to stir the reduction as it cooks. The thicker the sauce gets, the more you need to stir it to keep it from burning. How Fast Does Cooked Spaghetti Squash Spoil?